The upcoming smartwatch has been spotted next to references to Android 7.1.1 Nougat and LTE cellular support, so the Watch Sport will probably launch with Android Wear 2.0 out-of-the-box. LG Watch Style surfaced online in a set of (apparently) leaked official photos and was followed by the Watch Sport only a few days later. 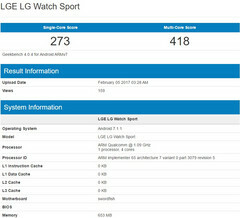 Now, after an appearance on GFXBench, the LG Watch Sport surfaces on benchmark website Geekbench. 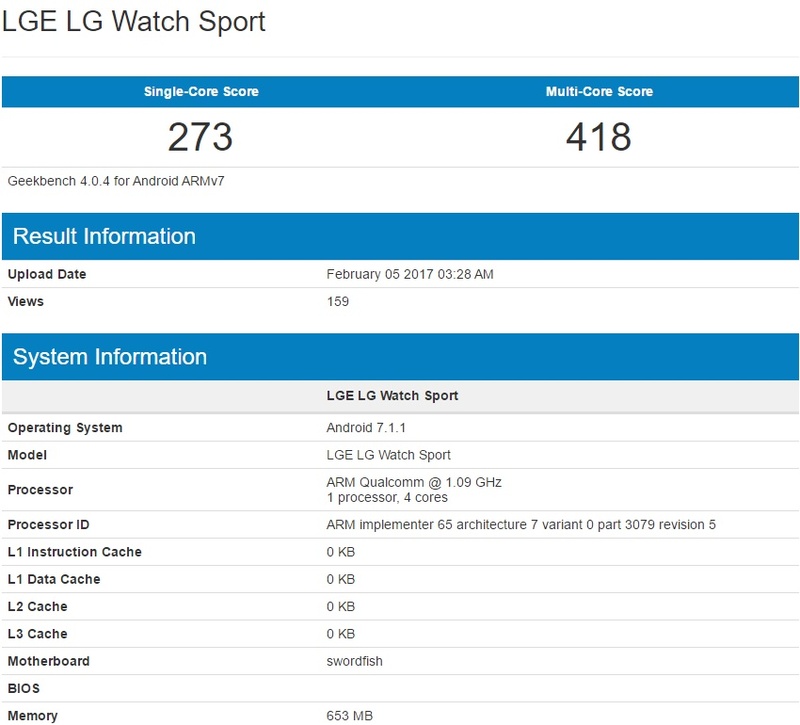 According to Geekbench, the LG Watch Sport has a quad-core Qualcomm processor inside, next to 768 MB RAM, 4 GB internal storage, and a 1.38-inch display with 480X480 pixels. Since it was listed with Android 7.1.1 Nougat on board and Android Wear 2.0 is coming soon, it is safe to assume that this smartwatch will launch running Google's upcoming operating system for wearables. The list of connectivity features is quite long, including LTE cellular support, WiFi 802.11 b/g/n, Bluetooth 4.2, NFC, GPS, as well as a heart rate sensor. Previous reports also mentioned a 430 mAh battery and IP68-certified protection from the elements. LG Watch Style is expected to be unveiled on February 8 and to hit the market for $349 USD - $100 USD more than the LG Watch Style.